Often we hear famous sportsperson, even great personalities, talk about how important failures are to success. They lay stress on how failures teach you much more than success does. While in the high of triumph one forgets the mistakes, failure opens the door for introspection, rectification and kindles the fire to climb the summit. 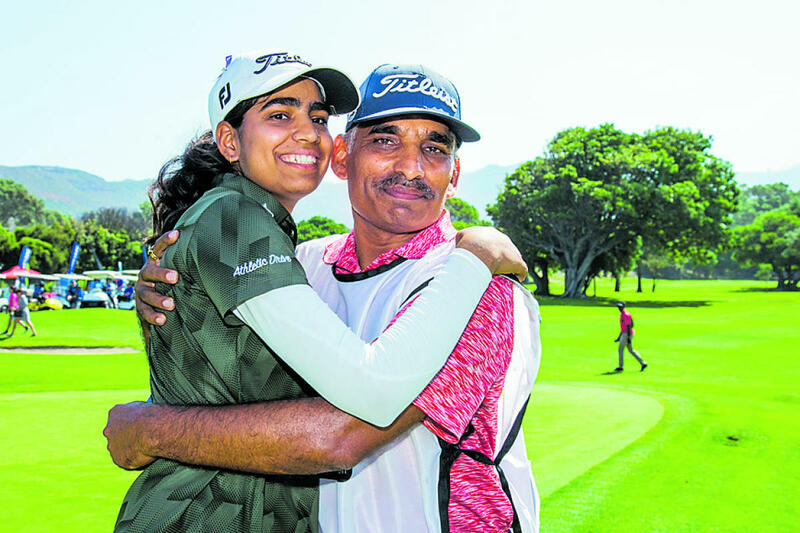 Teen talent Diksha Dagar, who last Sunday became the youngest Indian to triumph on the Ladies European Tour by scoring a superb win in the Investec South Africa Women’s Open, is another shining example of a successful sportsperson who used failure as a stepping stone. Making her LET debut last month at the Ladies Classic in Bonville, Australia, the 18-year-old Diksha got a first-hand lesson of how tough the professional circuit can be as compared to the amateur ranks. Diksha, with her father Narinder carrying the bag, made a decent opening of one-under 71. Confidence was sky high for the largely self-made golfer. The heavens opened up after round one in the mid-north coast city of New South Wales and Diksha, having not played previously on sodden courses, struggled in the next two rounds, carding 77 and 76. Those two cards were an eye-opener for the young kid and her father, a passionate golfer himself. “Those two rounds taught me a lot,” Diksha, a Class 12 student of Army Public School in New Delhi, told DH. “I had limited experience of playing on wet courses and I didn’t know how to cope with them. My papa, who was caddying for me, also had very little knowledge on how to tackle them. Diksha, who doesn’t have a full-time coach and still trains in the modest Army course back home rather than some of the modern courses in NCR, quickly put the Bonville lessons to practice. In the Actewagl Canberra Classic early this month, she finished tied 29th and then rose to tied fifth at the Women’s NSW Open. Her subsequent victory in the South Africa Open was also about learning from mistakes. She double-bogeyed in her very first hole and repeated that in the third too. At four-over after just three holes, Diksha was miles behind the pack at take-off itself. She then turned heads, and her fortunes, with a blistering six-under 66 in the second round before firing a 69 in the final round to pip home hope Lee-Ann Pace by one shot. “Bonville taught me a lot. Although I’ve played in professional events before as an amateur, the level of competition there was way above. And when I steadily moved up the leaderboard in the next two events, I believed I could win this season although, to be very honest, I didn’t expect it to come so soon. This win has opened up a world of opportunities for me and I believe I can play without any pressure for the next couple of years,” said Diksha. Diksha’s fast rise up the ranks is a fairytale story of an athlete battling several odds since birth. The left-hander was born with hearing impairment and has been fitted with cochlear implants. She was introduced to the sport when seven years old by her father, a lieutenant colonel in the Indian Army. Diksha quickly started to make an impression and her father decided her to enrol her in IGU events in 2011. She notched up her first win in 2014, acing the Girls Junior Category B in Pune. Next year she won her first amateur event at Tollygunge before going on to set various courses on fire. She decided to play the LET Q School last December and cracked it on the first attempt. Diksha has been doing all this mostly by herself. While she consults national coach Amandeep Johl from time to time, she doesn’t have a full-time expert by her side like some of the elite players. Interestingly, her kit is a mix and match of the clubs she purchases while travelling for events. “For the longest of time, she played with a kit that I gave her,” says Narinder. “The irons belonged to one brand, the drivers and putter another. With Diksha being a left-hander, it’s hard to get clubs for her. While playing an event abroad once, she picked up a few clubs which was on discount sale. She played with them without any custom fitting. Then a fitter came along and helped us later. Ranked 332 in the world now, Diksha has miles to traverse in a short while to make her Tokyo dreams come true. But there’s no questioning her natural talent and the potential to rise up the golfing ladder.